Manufacturers of CE Mark & AERB approved Lead Sheet at our ISO 9001:2015 certified Factory at Ambernath. HMS Metal Corporation is the largest producer of lead sheet in India. Our Lead Sheet is used for lining on Doors & Wall in X-ray Rooms, Dental X-ray Room, CT Room, Mammography Room and any location where Radiation Shielding is required. HMS Metal produces Lead Sheet with a consistent and high density, manufactured from soft lead. All lead used is subject to routine testing and checking. During production constant in-process inspection is carried out to check for any pinholes or cracks cause during production. Upon material ready, inspection for proper size & thickness is done for any possible quality issues. HMS Metal is only interested in providing its customers with the highest quality lead sheet available in the market place today. Our lead sheet are free from dross, oxide inclusions, laminations, scale blisters or cracks. HMS Metal is the only Indian lead manufacturer to offer the entire range of lead products to markets as diverse as Construction, Healthcare and Refinery. Our Lead Sheet is CE mark manufactured at our ISO 9001:2015 Certified Factory Located at Ambernath. 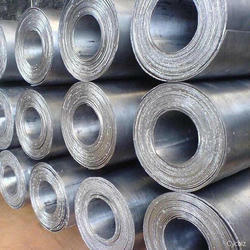 We manufacture Lead Sheet from .5mm to 50mm thickness, length upto 30' ft and width upto 6' ft depending on the thickness and are available in rolls and may be supplied flat if required to meet the demands of any application. Such is the consistency of the process that lead sheet will not vary in thickness by more than +/- 5% at any given point. Radiation Barrier - used in x-ray rooms in hospitals, dental clinics, and other radiography applications. Chemical Plants - tank linings and various corrosive environment applications. Sound proofing - ideal in walls and floors particularly when bonded or sandwiched between plaster or timber sheets. Flashings - particularly on roof applications around penetrations and gables on buildings. Manufacturers of CE Mark Lead Sheet at our ISO 9001:2015 certified Factory at Ambernath. Lead sheet is quite effective as a sound proofing material. Lead sheets provide effect noise absorption, sound & acoustical barriers & enclosures used for boats, office equipment, off-highway vehicles, engine rooms, generators & compressor housings. 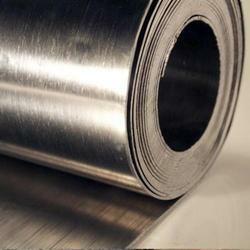 Lead has been used for many years as a sound barrier, in industries throughout the world. Properties such as high density, relatively high internal damping and low bending stiffness make lead a popular alternative to traditional materials such as plywood, plasterboard, glass and steel. Lead also has a much higher coincidence level than these traditional materials, which consequently creates a more effective barrier to the transmission of airborne sound, than most generally used sheet materials within the acoustics industry. When combined, these characteristics make lead the ideal choice for acoustic use. By virtue of its resistance to chemical corrosion, Lead Sheets finds use for the lining & bonding of chemical treatment baths, acid plants and storage vessels/tanks. 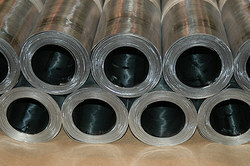 Lead is highly appreciated in apparatus construction for the chemical industry and primarily for nonferrous metallurgy, thanks to its special properties such as corrosion resistance to highly aggressive media, high electrical conductivity, great density, good malleability and low melting point, as well as the fact that it is particularly easy to repair. In most cases, lead needs a base or structural material because of its relatively low strength. Lead comes in varying grades and alloys of lead to provide precise degrees of corrosive resistance demanded by the most stringent design requirements and can be bonded to most products, using either a loose or homogeneous lining method. The inert nature of lead makes it ideal for lining of chemical tanks and components used in chemical processes particularly where acid exposure is involved.